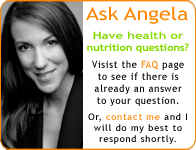 « Is Corn Sugar Healthy? Feeling adventuresome? A vegan challenge is like traveling to a foreign country. You’ll step out of your usual surroundings and learn to look at food differently as you begin to explore your world with a new perspective. Created by local celebrity nutritionist Angela Pifer, whose videos and articles have been featured on MSN Health, Kashi.com and Livestrong.com – the 28 Day Online Vegan Challenge is being featured on Groupon for $49 (reg $249, $200 OFF!) TODAY!! Grab your friends, give this as a gift and you can breeze through the extra cookie, stuffing and wine frolicking with peace of mind. You’ll be doing something about it in 2011! You must go to Groupon to purchase the deal! Week One: Seven Day Prep! Each day you’ll be instructed to read a step in the 28 Day Vegan Challenge Manual. By completing a few simple actions during your 7 day pre-cleanse you’ll greatly increase your success in this program. Week Two and Three: The Challenge is On! Experience and explore how good it feels to go vegan! Get daily support through the member only website, personally led by Angela Pifer, which will provide you the motivation to cross the finish line! For many people veganism isn’t a lifelong reality. The goal here is to identify the aspects of the program that you love and learn how to combine old and new styles of eating to create a lifelong eating plan.